For other uses, see The Best Years of Our Lives (disambiguation). The Best Years of Our Lives (aka Glory for Me and Home Again) is a 1946 American drama film directed by William Wyler, and starring Myrna Loy, Fredric March, Dana Andrews, Teresa Wright, Virginia Mayo, and Harold Russell. The film is about three United States servicemen re-adjusting to civilian life after coming home from World War II. Samuel Goldwyn was inspired to produce a film about veterans after reading an August 7, 1944, article in Time about the difficulties experienced by men returning to civilian life. Goldwyn hired former war correspondent MacKinlay Kantor to write a screenplay. His work was first published as a novella, Glory for Me, which Kantor wrote in blank verse. Robert E. Sherwood then adapted the novella as a screenplay. The Best Years of Our Lives won seven Academy Awards in 1946, including Best Picture, Best Director (William Wyler), Best Actor (Fredric March), Best Supporting Actor (Harold Russell), Best Film Editing (Daniel Mandell), Best Adapted Screenplay (Robert E. Sherwood), and Best Original Score (Hugo Friedhofer). In addition to its critical success, the film quickly became a great commercial success upon release. It became the highest-grossing film and most-attended film in both the United States and UK since the release of Gone with the Wind, selling approximately 55 million tickets in the United States  which equaled a gross of $23,650,000. It remains the sixth most-attended film of all time in the UK, with over 20 million tickets sold and ticket sales exceeding US$20.4 million. After World War II, returning veterans Fred Derry, Homer Parrish, and Al Stephenson meet while flying home to Boone City. Fred is returning from Europe as a decorated captain and bombardier from the Eighth Air Force. Homer was a petty officer in the Seventh Fleet when he lost both hands from burns suffered when his ship was sunk, and now uses mechanical hook prostheses. Al served with the 25th Infantry Division as a platoon sergeant in the Pacific. All three have trouble adjusting to civilian life. Al is a banker with a comfortable home and a loving family: wife Milly, adult daughter Peggy, and high-school student son Rob. He is promoted to Vice President in charge of small loans, as the president views his military experience as valuable in dealing with other returning servicemen. When Al approves an unsecured loan to a young Navy veteran, the president advises him against making a habit of it. Later, at a banquet in his honor, a slightly inebriated Al expounds that the bank (and America) must stand with the vets and give them every chance to rebuild their lives. Fred, once an unskilled drugstore soda jerk, wants something better, but the tight post-war job market forces him to return to his old job. Fred had met Marie while in flight training and married her shortly afterward, before shipping out less than a month later. She became a nightclub waitress while Fred was overseas. Marie makes it clear she does not enjoy being married to a lowly soda jerk. Homer was a high school football quarterback and became engaged to his next door neighbor, Wilma, before joining the Navy. Homer and his parents now have trouble dealing with his disability. He does not want to burden Wilma with his handicap so he eventually pushes her away, although she still wants to marry him. Peggy meets Fred when picking up her father home from a bar where the three men had re-united. They are attracted to each other. Peggy dislikes Marie, and informs her parents she intends to end Fred's marriage, but they tell her that their own marriage overcame similar problems. Concerned, Al demands that Fred stop seeing his daughter. Fred agrees, but the friendship between the two men is strained. When an obnoxious customer, who claims that the war was fought against the wrong enemies, gets into a fight with Homer, Fred intervenes and knocks the man down – costing him his job. Fred encourages Homer to put his misgivings behind him and marry Wilma, offering to be his best man. Wilma visits Homer and tells him that her parents want her to leave Boone City for an extended period to try to forget him. Homer bluntly demonstrates to her how hard life with him would be. When Wilma is undaunted, Homer reconsiders. Fred discovers his wife with another veteran. After complaining to Fred that she has "given up the best years of my life", Marie tells him that she is getting a divorce. Fred decides to leave town, and gives his father his medals and citations, including his Distinguished Flying Cross, with a citation signed by General Doolittle. At the airport, Fred books space on the first outbound aircraft, without regard for the destination. While waiting, he wanders into a vast aircraft boneyard. Inside the nose of a B-17, he relives the intense memories of combat. The boss of a work crew rouses him from his flashback. Fred persuades the man to hire him. People have gathered for the wedding of Homer and Wilma. Fred, now divorced, is Homer's best man. While the vows are exchanged, Fred and Peggy glance across at one another. At the conclusion, everyone gathers around the newlyweds. Still gazing over at Peggy, Fred walks across the room, takes her in his arms, and kisses her. He asks if she understands how things will be for them, that it could take years before they can get a life established. All the while, Peggy smiles fondly at Fred, and then kisses him again. Casting brought together established stars as well as character actors and relative unknowns. The jazz drummer Gene Krupa was seen in archival footage, while Tennessee Ernie Ford, later a television star, appeared as an uncredited "hillbilly singer" (in the first of his only three film appearances). [Note 1] Blake Edwards, later a film producer and director, appeared fleetingly as an uncredited "Corporal". Wyler's daughters, Catherine and Judy, were cast as uncredited customers seen in the department store where Fred Derry works. Sean Penn's father, Leo, played the uncredited part of the soldier working as the scheduling clerk at the beginning of the film. Teresa Wright was only thirteen years younger than her on-screen mother, played by Myrna Loy. Michael Hall, with his role as Fredric Marsh's on-screen son, is absent after the first one-third of the film. Director Wyler had flown combat missions over Europe in filming Memphis Belle (1944), and worked hard to get accurate depictions of the combat veterans he had encountered. Wyler changed the original casting that had featured a veteran suffering from post-traumatic stress disorder, and sought out Harold Russell, a non-actor, to take on the exacting role of Homer Parrish. For The Best Years of Our Lives, he asked the principal actors to purchase their own clothes, in order to connect with daily life and produce an authentic feeling. Other Wyler touches included constructing life-size sets, which went against the standard larger sets that were more suited to camera positions. The impact for the audience was immediate, as each scene played out in a realistic, natural way. Recounting the interrelated story of three veterans right after the end of World War II, The Best Years of Our Lives began filming just over seven months after the war's end, starting on April 15, 1946 at a variety of locations, including the Los Angeles County Arboretum and Botanic Garden, Ontario International Airport in Ontario, California, Raleigh Studios in Hollywood, and the Samuel Goldwyn/Warner Hollywood Studios. In The Best Years of Our Lives cinematographer Gregg Toland used deep focus photography, in which objects both close to and distant from the camera are in sharp focus. For the passage of Fred Derry's reliving a combat mission while sitting in the remains of a former bomber, Wyler used "zoom" effects to simulate Derry's subjective state. The fictional Boone City was patterned after Cincinnati, Ohio. The "Jackson High" football stadium seen early in aerial footage of the bomber flying over the Boone City, is Corcoran Stadium located at Xavier University in Cincinnati. A few seconds later Walnut Hills High School with its dome and football field can be seen along with the downtown Cincinnati skyline (Carew Tower and PNC Tower) in the background. After the war, the combat aircraft featured in the film were being destroyed and disassembled for reuse as scrap material. The scene of Derry's walking among aircraft ruins was filmed at the Ontario Army Air Field in Ontario, California. The former training facility had been converted into a scrap yard, housing nearly 2,000 former combat aircraft in various states of disassembly and reclamation. It is seldom that there comes a motion picture which can be wholly and enthusiastically endorsed not only as superlative entertainment, but as food for quiet and humanizing thought... In working out their solutions, Mr. Sherwood and Mr. Wyler have achieved some of the most beautiful and inspiring demonstrations of human fortitude that we have had in films." He also said the ensemble casting gave the "'best' performance in this best film this year from Hollywood". Several decades later, film critic David Thomson offered tempered praise: "I would concede that Best Years is decent and humane... acutely observed, despite being so meticulous a package. It would have taken uncommon genius and daring at that time to sneak a view of an untidy or unresolved America past Goldwyn or the public." The Best Years of Our Lives has a 98% "Fresh" rating at Rotten Tomatoes, based on 37 reviews. Chicago Sun Times film critic Roger Ebert put the film on his "Great Movies" list in 2007, calling it "... modern, lean, and honest". 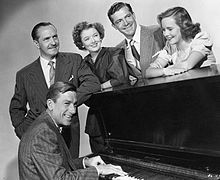 The Best Years of Our Lives was a massive commercial success, earning an estimated $11.5 million at the North American box office during its initial theatrical run. When box office prices are adjusted for inflation, it remains one of the top 100 grossing films in U.S. history. However, because of the distribution arrangement RKO had with Goldwyn, RKO recorded a loss of $660,000 on the film. The Best Years of Our Lives received nine Academy Awards. Fredric March won his second Best Actor award (also having won in 1932 for Dr. Jekyll and Mr. Hyde). Despite his Oscar-nominated performance, Harold Russell was not a professional actor. As the Academy Board of Governors considered him a long shot to win, they gave him an honorary award "for bringing hope and courage to his fellow veterans through his appearance". When Russell in fact won Best Supporting Actor, there was an enthusiastic response. He is the only actor to have received two Academy Awards for the same performance. In 1992, Russell sold his Best Supporting Actor award at auction for $60,500 ($108,000 today), to pay his wife's medical bills. Some posters say the film won nine Academy Awards due to the honorary award won by Harold Russell, and the Irving G. Thalberg Memorial Award won by Samuel Goldwyn, in addition to its seven awards for Best Picture, Best Director, Best Actor, Best Screenplay, Best Supporting Actor, Best Editing, and Best Music Score. National Board of Review: NBR Award Best Director, William Wyler; 1946. New York Film Critics Circle Awards: NYFCC Award Best Director, William Wyler; Best Film; 1946. Bodil Awards: Bodil; Best American Film, William Wyler; 1948. Cinema Writers Circle Awards, Spain: CEC Award; Best Foreign Film, USA; 1948. In 1989, the National Film Registry selected it for preservation in the United States Library of Congress as "culturally, historically, or aesthetically significant". American Film Institute included the film as #37 in its 1998 AFI's 100 Years... 100 Movies, as #11 in its 2006 AFI's 100 Years... 100 Cheers, and as #37 in its 2007 AFI's 100 Years... 100 Movies (10th Anniversary Edition). On April 17, 1949, Screen Directors Playhouse presented The Best Years of Our Lives on NBC. Andrews and Janet Waldo starred in the half-hour adaptation. ^ At the time the film was shot, Ford was unknown as a singer. He worked in San Bernardino as a radio announcer-disc jockey. ^ Thomson 1993, pp. 490–491. ^ " 'Best Years of Our Lives' (1946)." Box Office Mojo. Retrieved: February 4, 2010. ^ Kantor, MacKinlay (1945). Glory for Me. Coward-McCann. OCLC 773996. ^ a b Orriss 1984, p. 119. ^ a b Levy, Emanuel (April 4, 2015). "Oscar History: Best Picture–Best Years of Our Lives (1946)". Emanuel Levy: Cinema 24/7. Archived from the original (review) on January 18, 2017. Retrieved January 16, 2017. ^ "The 19th Academy Awards (1947) Nominees and Winners." oscars.org. Retrieved: November 20, 2011. ^ "Domestic Total: Estimated tickets: 'The Best Years of Our Lives'." Box Office Mojo. Retrieved: February 10, 2015. ^ "Box office: 'The Best Years of Our Lives'." Box Office Mojo. Retrieved: February 10, 2015. ^ "Top 100 films." Channel 4. Retrieved: October 25, 2010. ^ a b c d Orriss 1984, p. 121. ^ Kehr, Dave. "'The Best Years of Our Lives'." The Chicago Reader. Retrieved: April 26, 2007. ^ Orriss 1984, pp. 121–122. ^ "Trivia: 'The Best Years of Our Lives'." Turner Classic Movies. Retrieved: February 10, 2015. ^ Crowther, Bosley. The Best Years of our Lives. The New York Times, November 22, 1946. Retrieved: April 26, 2007. ^ Thomson, 2002, p. 949. 4th Edition; the first edition was published in 1975. See Thomson, David (1975). A Biographical Dictionary of the Cinema. London: Secker & Warburg. OCLC 1959828. ^ " 'The Best Years of Our Lives'." Rotten Tomatoes. Retrieved: July 30, 2010. ^ Ebert, Roger. "The Best Years of Our Lives (1946)." Chicago Sun Times, December 29, 2007. Retrieved: November 20, 2011. ^ "All Time Domestic Champs". Variety, January 6, 1960, p. 34. ^ "All-time Films (adjusted)." Box Office Mojo. Retrieved: September 19, 2010. ^ Bergan, Ronald. "Obituary: Harold Russell; Brave actor whose artificial hands helped him win two Oscars." The Guardian, February 6, 2002. Retrieved: June 12, 2012. ^ "Those Were the Days". Nostalgia Digest. 38 (4): 35. Autumn 2012. Flood, Richard. "Reel crank – critic Manny Farber." Artforum, Volume 37, Issue 1, September 1998. ISSN 0004-3532. Thomson, David. "Wyler, William". The New Biographical Dictionary of Film. 4th Edition. London: Little, Brown, 2002. ISBN 0-316-85905-2. Wikimedia Commons has media related to The Best Years of Our Lives.